We offer a specialist tarmac repair and restoration service for both domestic and commercial customers throughout Guildford and the surrounding areas. If left for too long and without proper maintenance, tarmac will begin to deteriorate. The colour will fade, and you might see cracks or even chunks break off. These minor damages can be tackled with our crack repair compound and cold lay repair. We then clean the surface with our pressure washer before applying our tarmac restorer. If your tarmac surface is too damaged this service may not be for you. Contact us today for a free survey and quote. Every imprinted concrete driveway or patio should be cleaned and have a new coat of sealer applied every 3-5 years. The sealer protects the concrete from stains and general wear and tear whilst also making it waterproof. In the situation where your imprinted driveway has faded, we also provide a re-colour service as well as a chip and crack repair. If your surface is known to be a bit slippery, which is pretty common for imprinted concrete, we can apply an anti-slip additive to the sealer giving the surface a “sandpaper-like” texture whilst being invisible to the naked eye, it provides extra grip for those walking on it. 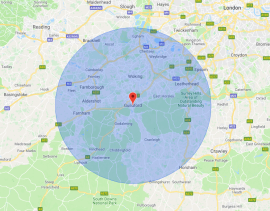 We offer a specialist commercial cleaning, pressure cleaning and jet washing service throughout Guildford and the surrounding areas. We offer a pressure washing service for commercial clients on all hard-external surfaces. No matter what your problem is, whether it’s graffiti removal, cleaning car parks, industrial metal cladding, stained cedar cladding, bonded insulation removal we will find a solution to fit you. We pride ourselves on our flexibility when it comes to our work; if this means we have to work out of office hours or weekends that’s fine. Our working standards are second to none and we take great pride in our business, taking care to ensure reliability, high standards and service.